The Hazleton (PA) Fire Department had a lot of experience with KME products as its fleet contains two KME engines, a KME aerial ladder, and a KME aerial platform. So when it came time to purchase a rescue-pumper, Hazleton again turned to KME. 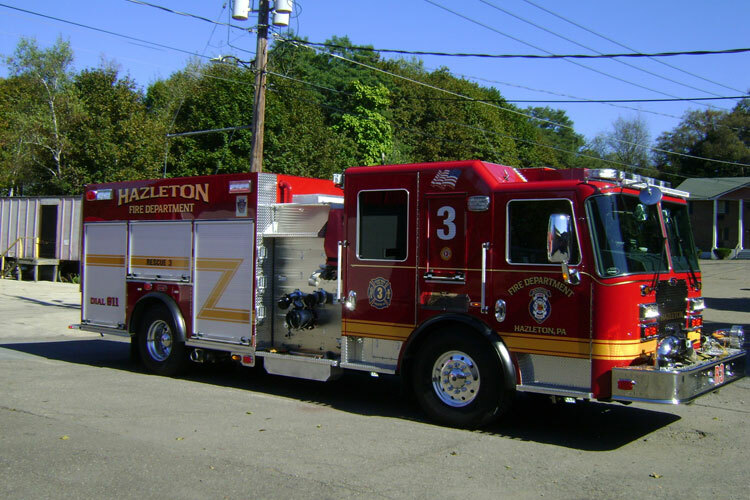 Hartz notes that many of Hazleton’s streets are tight, “so they wanted as short a vehicle travel length as possible for all the equipment they wanted to carry.” The rescue-pumper has a 201-inch wheelbase, overall length 39 feet 2 inches, and an overall height of 9 feet. Ryan Slane, KME product manager, says KME put a Challenger WB (wide bed) body 162 inches long on the vehicle to accommodate the side-to-side hosebed that Hazleton wanted. “We were able to give them 29-inch-deep full height and depth compartments on the driver’s side and the same size compartments except a 14-inch-deep split-depth compartment on the officer’s side where the ground ladders are in the water tank’s tunnel,” Slane says. The ladder tunnel holds a 24-foot two-section extension ladder, a 14-foot roof ladder, attic ladder, two hard suction hoses, and a long backboard. The rescue-pumper is powered by a Cummins 450-horsepower ISL 9 diesel engine, and an Allison 3000 EVS automatic transmission and has a Hale QMax-200 single-stage 2,000-gpm pump, a 750-gallon water tank, two 1¾-inch crosslays, one 2½-inch crosslay, two 2½-inch hosebed discharges, and a 2½-inch discharge to a gated wye in the 21-inch extended front bumper. The front bumper also has a 6-inch front suction intake with an inline valve and a Hurst hydraulic tool quick connection. At the back of the truck, Hazleton uses the rear compartment to house its Hurst hydraulic rescue tools that include a spreader, cutter, combi tool, and rams as well as two Streamline hydraulic hose reels with 100 feet of hose each. The rescue-pumper’s hosebed is set up to carry 2,000 feet of 4-inch LDH, 200 feet of preconnected 2½-inch hose with a Task Force Tips Blitzfire nozzle on the driver’s side, 200-feet of 2½-inch hose with a play pipe nozzle on the officer’s side, and dead loads of 3-inch, 2½-inch, and 1¾-inch hose. The rig also carries a high-rise pack filled with 1¾-inch hose in a side compartment.